Senior adventure travel opens a world of alternative exotic travel for the over fifties-hill walking, sailing, biking, African wildlife safaris, trekking in the Himalayas...the only limits are your desire. and imagination. This is my story of adventure travel, set in Rwanda, "the heart of Africa". My first visit to Rwanda was 1989. Returning there in 2007, the first year of my retirement, and with the benefit of maturity, I was moved by the challenging social and geopolitical issues of the region. And I was awestruck by my encounter with the Mountain Kings. 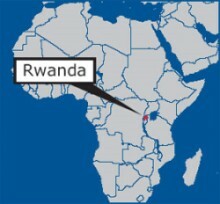 Rwanda - the "heart" of Africa - is situated in East/Central Africa, bordered by the Democratic Republic of Congo, Uganda, Burundi and Tanzania - 900 miles west of the Indian Ocean, 1250 miles east of the Atlantic. It is one of the smallest, poorest, and most densely populated countries in Africa, almost ten million people living in an area not quite the size of Munster in Ireland. Forty percent of the population live on less than a $1 a day, and life expectancy is under 50 years. And yet, Rwanda holds a priceless endowment in trust. I used to imagine Africa as a land that is dry, flat, brown, and hot - and no doubt parts of the continent are like that. But the countryside we drove through that morning could scarcely have been more different. Because, though we were just 75 miles south of the equator, we were so high up on the Continent's central plateau - 10,000 feet and climbing - that in the cold thin air, "you shiver more than you sweat". The land that had once been heavily forested has been given over almost entirely to farming and charcoal making. It seemed like every inch was cultivated with bananas, corn, tea, and coffee. Although over farmed and overcrowded, this "green country" with two hundred types of trees, and a myriad of flowering plants, is dramatically beautiful. In this "Pays des mille collines" - land of a thousand hills, the landscape ranges from dense equatorial forest in the North West, to tropical Savannah in the East. In places the tangled umbrella of flat - topped acacia woodland is interspersed with open grassland. The most breathtaking feature is the mist shrouded Virunga Volcano country, towering up almost 15,000 feet, and nearly covered with rich, green rain forests. The Virungas are the only remaining forests, and there in the Parc de Volcans they shelter the only survivors of the once abundant wildlife. That was our destination and the prize was a hoped for meeting with the last of the Mountain Gorillas. We travelled for ninety minutes on an excellent road from the capital Kigali, to the city of Ruhengeri in the district of Musanzi. This is Rwanda's most mountainous district; five of the eight volcanoes of the Virunga chain are within its boundaries, and most of Rwanda's mountain gorillas are found there. We were met at Kinigi by our guide Joshua, who as well as knowing where the gorillas were likely to be, would help to accustom them to the presence of strangers, should we be lucky enough to meet them. We were a party of six, and Joshua briefed us with some strict guidelines. We were not to enter the park if we had any flu like symptoms, as the gorillas were susceptible to colds and pneumonia. Viewing would be for a maximum of one hour, and we were not to approach closer than 20 feet. We were advised to avoid any sudden movement, and to speak in a low voice. "A gorilla may try to take something from you, like a camera or handbag, do not resist, crouch down, act servile, and surrender it. If a gorilla should charge or screech at you, do not be alarmed, look away from the gorilla and follow my instructions. This is their territory." These rules served to heighten my excitement and anticipation that we would indeed come face-to-face with those extraordinary animals. The ability to get close to gorillas in this unique way was made possible by the pioneering work of an America zoologist, Dian Fossey. She studied and lived among them from 1963 to her violent death, probably at the hand of poachers, in 1985. Her work and methods (described in the film Gorillas in the Mist) accustomed them to the presence of human beings, though they remained wild animals. The Park begins where the clearing and cultivation ends. We proceeded on foot from the densely populated farmland to the silence of the dripping, moss covered Hagenia trees, and giant Lobelias. We climbed for almost three hours. The terrain was difficult, almost straight up, very cool and wet. Sometimes we hung on to overhanging vines to get along, trying to avoid the huge stinging nettles that were everywhere. Sometimes we had to go on hands and knees. The exhilarating climb to the gorilla's natural habitat, of shady bamboo forest, offered fantastic views in all directions. Occasionally we glimpsed the peaks through an opening in the forest's canopy. For a long time we found no sign of gorillas, though the rainforest was alive with the calls of colourful birds, the chattering of the rare golden monkey, and was littered with fresh spoor of the elusive population of buffalo and elephant. Suddenly, the guide signaled us to stop, and he silently began cutting a window through the lush green mass of foliage, with his machete. Joshua motioned me forward, and I crept to his side, both of us stooping low. He pointed and I peered through the opening. There they were - man's closest relative, the basis of the King Kong myth - the last of the Mountain Kings of Africa. Nothing could have prepared me for that moment. I have seen the Big 5 in Masai Mara Kenya - Lion, Elephant, Buffalo, Leopard, and Black Rhino. I saw vast herds of Zebras, Gazelles and Wildebeest in Serengeti. I have cruised the Zambezi River at sunset, close to the Victoria Falls - or Mosi-oa-Tunya (the Smoke that Thunders) - sighting Hippos, Crocodiles, and Waterbuck. Yet the impact of encountering a Silverback Gorilla and his family, in that dramatic natural setting was my most poignant and memorable wildlife experience. There are seven family groups in the Virungas. 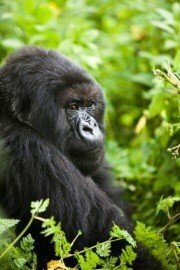 Our group - the Sabyino family - was lead by Guhonda, a powerful adult male Silverback. Guhonda, "The world's biggest mountain gorilla," was imposing, yet not at all frightening. He looked about six foot tall, with an arms spread of about eight feet, and weighed about five hundred pounds The group was feeding on leaves and bamboo shoots in a long narrow meadow, just about twenty yards from our cover. To my surprise and delight the guide beckoned us forward slowly into the clearing. The meadow was part of an extinct volcano, richly carpeted with grass, and surrounded with heavy forests. We moved to within thirty feet of the family - Guhonda stared at us with a mixture of curiosity and uncertainty. The family moved up the slope of the crater, back into the forest and we followed, approaching to within 20 feet. They settled down contentedly into a nest-like area among bamboo trees, Guhonda gazing at us all the time with his dark brown piercing eyes. We watched in silence this family of passive, seemingly timid giants. The only sounds were those from the gorillas feeding, with their peculiar grunting and purring noises, which were somehow reassuring. Joshua grunted back as if to say "everything is ok". And then it was time to go - but not before the old Silverback put on a show of screeching and chest beating to show us who was King of the Mountains. We stumbled and slid on the mud back down the mountain, but we were in high spirits, elated by the encounter. Back at the hotel that night we were still as excited as children, reflecting and talking animatedly about the day's events. I wish I could end my account of that privileged encounter on that happy note, yet the story of the Mountain Gorillas cannot be told without reference to the competition for land in an economy based mainly on agriculture; and the legacy of the 1994 genocide. Can the Mountain Gorillas survive? Can the mountain gorilla survive? Destruction of the forest for farming, and charcoal making has driven the gorillas into a little corner of the country. Snares set for antelope also catch and maim gorillas. Cattle, kept for prestige as well as food, chum up the ground until it looks ploughed. They crush the plants the gorillas eat, shut them out of the best feeding areas, and force them higher and higher up the mountain, into cold air where they are vulnerable to pneumonia. The herdsmen and hunters have worked the Virunga slopes since time began. They use the meadows for grazing, the hunters ranging everywhere for meat and hides. However, there is a more compelling reason why their survival is endangered. On the return journey from the Parc de Volcans, I saw groups of up to one hundred people sitting on the grass, under groves of eucalyptus trees. A "jury" of seven people with green, yellow and blue sashes was seated on a wooden bench, behind a long table, and a man stood nervously before them. This scene was repeated in many villages. "These are Gacaca courts", Joseph explained. The word Gacaca means "on the grass". This was a traditional means of solving village disputes. Since 1994 the Rwandan government has struggled to administer justice to hundreds of thousands of genocide suspects. The regular Rwandan courts were so overwhelmed that the government adapted this traditional form of dispute resolution in trying some genocide cases. Our Hotel Mille Collines in Kigali was the hotel featured in the film "Hotel Rwanda", where up to a thousand, mainly Tutsis, had gained sanctuary. The farmers are Hutus, the herdsmen are Tutsis, and in this poor and beautiful central African country, the worst human disaster of the twentieth century occurred - 800,000 people slaughtered in 100 days, and three million refugees were scattered throughout Rwanda, Zaire, Burundi and Tanzania. I wanted to learn more about the genocide, so Joseph suggested I visit the Memorial Centre. It is situated on a hilltop overlooking the capital Kigali, and was opened in 2004, ten years after the genocide. It includes a museum, a genocide research center, and a memorial garden. As we walked towards the garden, with no knowledge of what to expect, a strange suffocating, apprehensive feeling came over me. The guide, himself a genocide orphan, informed us that the garden contained eleven mass graves, of more than 250,000 victims, who were murdered around Kigali. This is one of 200 genocide sites, such as churches and schools, which are still littered with the skulls, bones, shoes, clothes, and prayer books of Tutsis who took refuge there. "We are still finding mass graves" he informed us. He brought us to a room containing hundreds of photographs of victims. With deep sadness, and great dignity, he pointed to a photograph of his family, "My parents, my two brothers, my two sisters ... I was at university in Burundi at the time." I felt at ease to ask him about his ethnic identity. He looked away, sighed, and in a low voice replied, "We are all Rwandans now." If he truly believed that, it was an extraordinary gesture of forgiveness and resilience, in a country where thousands of perpetrators live free, side by side with their victims. On a continent affected by cycles of war, corruption and mismanagement, Rwanda today seems in many ways a model of recovery, change and hope. Can the mountain gorillas survive? The question seems almost insensitive when set against the human tragedy of Rwanda. And yet conservationists argue that man's destiny cannot be separated from his environment. Some local politicians argue that conservation is a luxury they cannot afford. Others contend that Rwanda's extraordinary flora and wildlife could make tourism one of the biggest sectors of the economy. The genocide of 1994 can never be forgotten. And yet if Hutus and Tutis can coexist, then perhaps it's possible to envisage Rwanda as an eco-tourist destination, where its prized endowment "The Mountain Kings of Africa," can be protected and cherished by future generations. or other retirement story with my readers.